The Canadian Silver Maple Leaf is a 1 troy ounce (31.1g) silver bullion coin minted by the Royal Canadian Mint. With a 99.99% (0.9999 or ‘four-nines’) guaranteed purity, it is among the purest forms of silver bullion currently available; most other bullion coins struck by government mints have a 99.9% standard purity. Depicting the iconic Canadian maple leaf, they are some of the most recognizable silver bullion coins in the world. The coin, issued annually by the Canadian government, has been minted since 1988, and struck every year since. Mintage rates have varied over the life of the series. In 1988, just over 1 million coins were produced; this was increased to 3.3 million in 1989 to reflect high demand for the coins. In particular, the 1996 and 1997 versions are highly desirable due to low mintage rates (101,000 minted in 1997, compared with 1.2 million minted in 1999). 23.1 million were minted in 2011, setting a yearly record for this coin. The Maple Leaf is legal tender in Canada, with a face value of $5 CAN. This is among the highest face values of all international silver bullion coins. Silver Maple leaf coins differ from their Gold and Platinum counterparts in that they are highly desired by collectors, pushing the price well beyond bullion value. Canadian Silver Maple Leaf coins are typically valued at least 10% over the spot price of silver. This 38mm diameter coin currently features an iconic Canadian maple leaf design by Dora de Pedery-Hunt on the reverse. 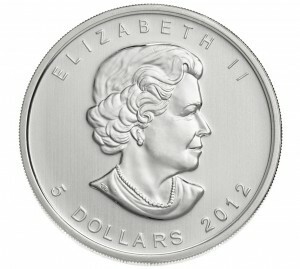 The obverse features the head of Queen Elizabeth II, designed by Susanna Blunt. There are three different versions of this design, known as the young head, old head, and older head. The year and face value of the coin are also shown on this side. Similar designs featuring the national symbol of Canada are also made by the Royal Canadian Mint in Gold, Platinum, and Palladium. There have been several ‘special edition’ variations on this coin, such as a colored maple leaf and holographic enhancements. This is in addition to several special yearly designs, such as a 2009 coin design created for the 2010 Winter Olympics, and a 10 oz version produced in 1998 to commemorate the 10th year of the coin series. Proof coins were released in 1989 only. All of the Canadian silver maple leaf coins bear the phrase “Fine Silver 1 oz Argent Pur” along the bottom edge of the reverse side. When sold directly by the mint, Canadian Silver Maple Leaf coins come in 25-count tubes housed in a 500-count yellow box. From there, they may be sold directly to collectors or through resellers such as coin shops and precious metal dealers. Because they contain 1 ounce of pure silver, these coins can easily be exchanged for cash, making them a smart investment. Many of the Canadian Silver Maple Leaf coins have a common blemish known as “Milk Spot.” This cloudy spot occurs when a cleaning detergent becomes baked into the coin during the production process. However, such blemishes do not affect the metal content of the coin or its investment potential.